The 2018 Top of the Gulf Regatta Presented by Ocean Marina has lived up to its reputation for delivering close and competitive racing, and this year the weather made the racing even tougher. Over the past four days sailors have experienced everything from moments of becalm to 25 knot squalls, thunder and lightening, and blue skies indicative of sailing in the tropics. And as the competitors gathered for the Ocean Marina Gala Dinner, it was smiles all around. THA72 finished their regatta with two wins. Other than a second in Race 4 of their series, former Optimist World Champion Noppakao Poonpat has driven the TP52 expertly winning five of the six races contended, not at all bad for her first time helming a boat of this size and calibre. Thailand sailing looks to be in good hands! Don't let the results sheet fool you, however, as the racing between fellow-TP52 Ark 323 crewed by an all-Chinese team lead by Li Hongquan, has been close. The short windward/leewards were testing and throughout the Chinese were ready to pounce on the smallest of mistakes, it's just that THA72 made very few, and thus the Kevin Whitcraft/ Tom Whitcraft owned THA72, helmed by Noppakao Poonpat, are IRC 1 champions. In IRC 2 David Dimmock and crew on the Club Swan 42 Loco (USA) did the early running and despite a third place in Race 4 they won the class with one race to spare, ahead of Gary Baguley's El Coyote (AUS) in second. A first in the final race for Barry Waugh's Fujin (AUS) wasn't enough to outscore Jean Rheault's Souay1 (CAN) whose results in the second half of the series saw them slide into third place overall. The Cruising Class boats have had a little more action than expected this week, with a number of windward/leewards replacing their “traditional” long distance series of races, and the sailors seem happy with the change. 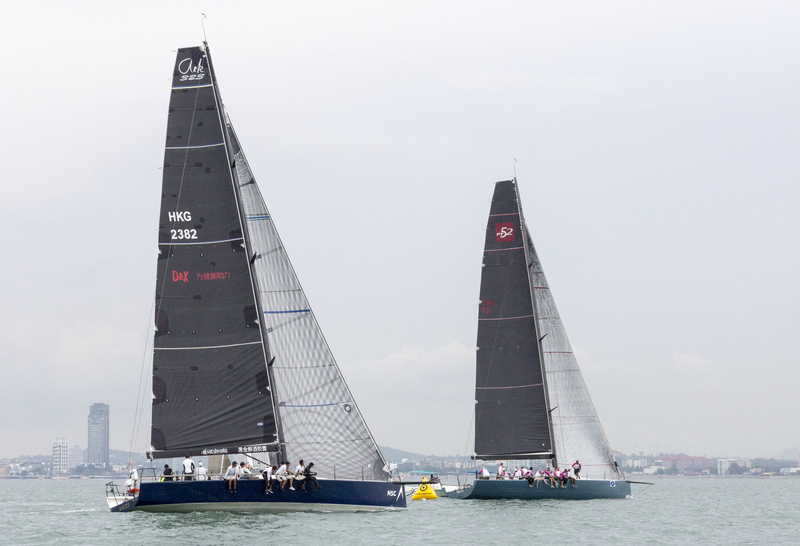 A single race today brought their series tally to five and with the drop in play it was the all-Japanese crew on Team Spray that took the win by a single point from Pote Suyasinto's all-Thai team on Le Vent. Two points further back was Tim McMahon's Sail Quest Hi Jinks in third. The one-design Platu class has seen some exceptionally close racing this week and no boat has dominated. A few slips along the way in the ever-changing weather conditions has seen seven out of the 11-strong fleet on the podium at least once during the regatta, and despite a sixth place in the final race Rolf Heemskerk's Team Viewpoint (MAS) were crowned 2018 Coronation Cup winners, defending their title in the process. Ithinai Yingsiri's Thai team on Pine-Pacific were in the running throughout but a couple of sixth place finishes when they didn't read the wind-shifts correct, and a seventh in the final race hurt their scorecard and they had to settle for second overall, ahead of Chris Way's Easy Tiger III (AUS) in third. It's never a foregone conclusion in sailing, but then there's only one Keerati Bualong. 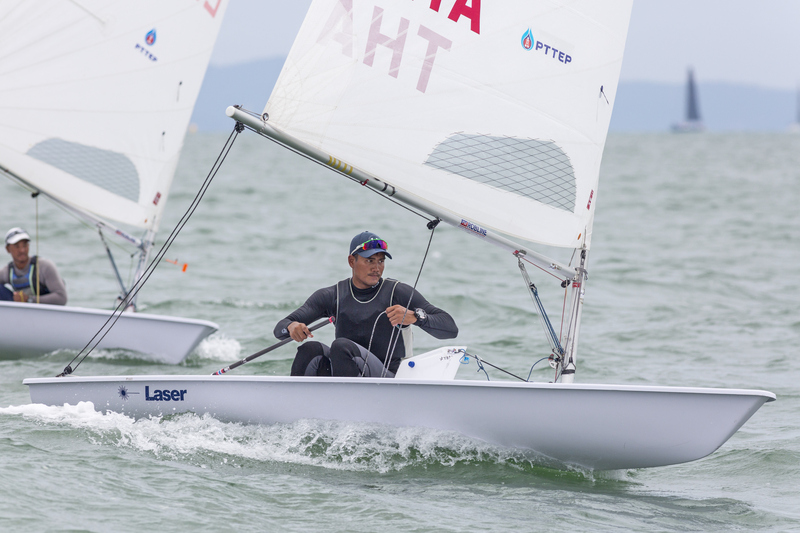 Thailand's top Laser sailor and two-time Olympian has won Class 9a for years then anyone cares to remember and this year produced a masterful showing. Not always leading from start to finish, having to come from behind at times and mastering the mixed bag of conditions, he finished with a clean sheet – six wins from six races. Impressive. In Class 9b (Laser 4.7s), Saranrong Poonpat and Sophia Gail Montgomery have traded places throughout the series but it was Saranrong who performed better on the final day and secured the win by a single point. Paliga Poonpat held onto third from a late charging Chanokchon Wangsuk. The Double-Handed Monohull Dinghy Class (Class 10) saw a mix of 420s, 470s, 49ers and 49er FXs competing together on handicap. Having lead from Race 1, Navee Thamsoontorn/ Nut Butmarasri (470) held on to take the title despite two third places today. Suthida Poonpat/ Narisa Satta (470) had an excellent final day with a 2,1 scoreline tying them on points with Suthon Yampinid/ Kittipoon Kumjorn (420), however, after count-back Suthon Yampinid/ Kittipoon Kumjorn were awarded second place. Two races were completed for both Optimist fleets on the final day bringing each series tally to five. 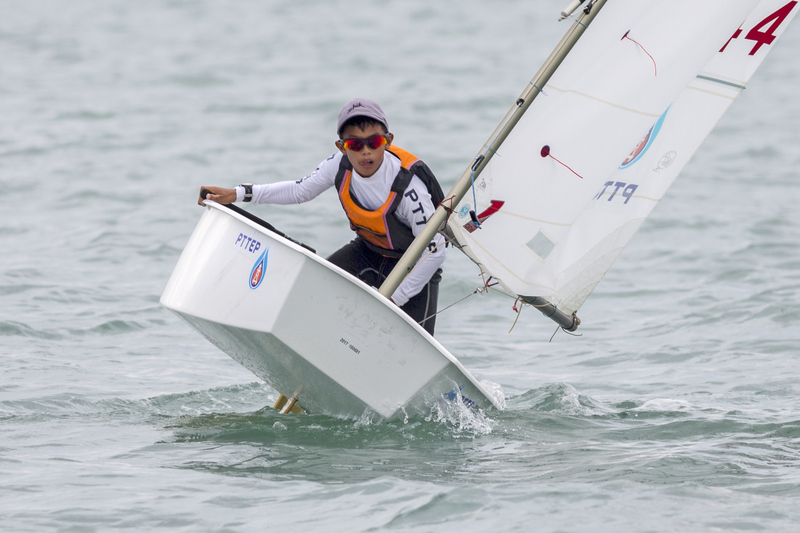 A tough final day for Hong Kong hopeful Duncan Gregor in the Gold Fleet saw him finish fifth overall after holding second earlier in the series, and the top international youngster. Having had a slow start to his series, M.L. Weka Bhanubandh put in some solid performances to work his way up the standings to finish second overall and top sailor Under 12, with Patihan Vorrasart in third. The glory and title, however, goes to the most consistent sailor on the course over three days, whose 4,1,1,1 scoreline ensure he defended his title, Panwa Boonak – the 2018 Thailand Optimist National Champion. 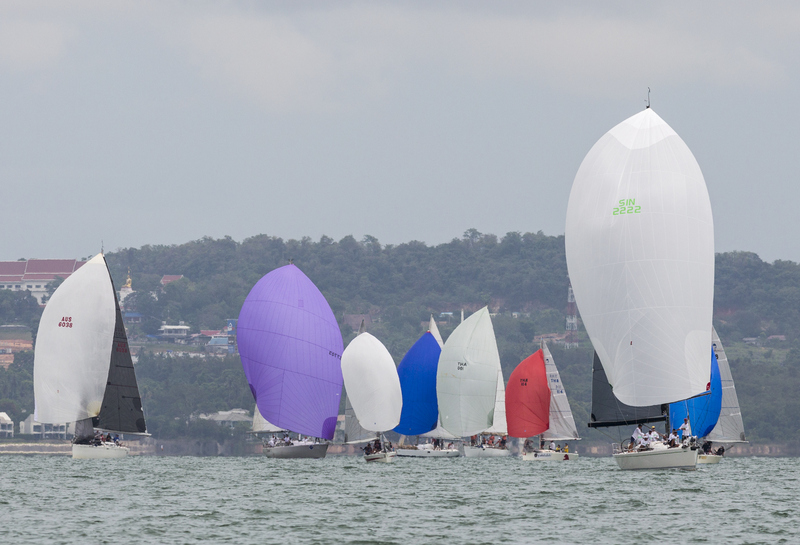 Yoth Srimanchanda comfortably won in the Silver Fleet with Attasuk Boontawee's two bullets on the final day enough for him to sneak into second ahead of Krithphet Suwannarai in third. All sailors, young and old, beginner and professional, came together for the Ocean Marina Gala Dinner where prizes were presented by Mr. Ittipol Khunpluem, Vice Minister for Tourism and Sports Thailand, and Admiral Thanee Phudpad, Vice President of the Yacht Racing Association of Thailand.